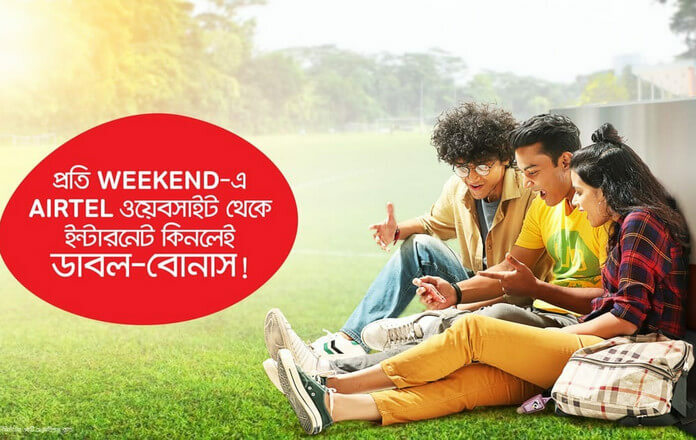 Airtel Weekend Internet Bonus Offers 2019! Airtel brings the Internet’s double-bonus offer! Between 10 pm and Saturday at 11:59 pm on Thursday, the internet will be able to buy full double-bonus from the internet. Now all will be double-double! Airtel 600MB at Tk 29, validity 3 days. 1GB 45Tk, with 7 days validity. [email protected] validity 28 days. 6 GB 3GB for 10 days (Bonus) 129 Validty 10 Days, 10GB 5 GB for 10 Days (Bonus). The above packages are applicable only during the offer period, when the offer ends, you have to leave the regular package. The offer will run from Thursday 10 pm to Saturday to 11.59 pm. Airtel prepaid user can accept the deal. To activate this offer Click Here. You must buy Weekend Internet Bonus Offers from Airtel website. No any code for activation this offer. Dial *3# to check MB balance. You can take the offer multiple times during the offer.